"Oh, by the way, Guy wants you to take him to the hardware store, he wants to get some tape." "He says he wants 'wood tape'." "Sometime this weekend. He is really looking forward to going." Guy is my four-year-old son. No problem, I just need a fraction of an excuse to visit a hardware store. "See what I made, Dad?" "That's very nice Guy. What is it?" "Well, this one is a big board." "Yes, I see that, very nice." "And this is a table I want you to make by cutting up the board with the saw. I'm going to paint squares on it." "But first, I have to go to the hardware store. I have to make a list." "How do you spell 'tape'?" "How many letters? I've got... three." "Ok Daddy, I'm ready to go to the hardware store now." "Yes, I have my shopping list. I cut it out." "You did, what's on it?" "Oh, yes," I say, now remembering the Friday conversation, "anything else on your list?" "Oh. Well, get your shoes on." We are now at Home Depot. This is his shopping trip, so I completely let him take the reins. I decide to keep my involvement to a minimum, partly for entertainment, mostly as a learning experience for Guy. "Where is the tape, Dad?" "This is your trip, Guy, you are going to have to find it. You can try asking the people in orange aprons." "What does he want?" he asks me. The man looks at me as if I were daft. "Wood tape?" "Honestly, I have no idea. I haven't asked him what it's for. He can probably tell you." Again the look. This shopping trip is turning out to be very entertaining. "Go to the end of the aisle, turn left, go until you see paint." "Thank you," Guy says, then "This way Daddy." "Ok" I say. "Thank you," I say to the fellow, and trundle off after Guy. We find the paint department right where we were told it was. "Where's the tape?" he asks me. "I don't know, Guy, you will have to ask," I say with a malicious grin. With one look she could tell that it was I who was with Guy, not the other way around. Clever lady. "Yes, I am." "Ok, just making sure," still with a frown when I don't offer more. She looks as though she is about to pistol-whip me with the phone and call security in a single gesture, so I own up quickly: "This is his project, and I'm letting him be in charge." She doesn't really relax until she hears Guy call me 'Daddy'. "To put on wood," he says. Now that it is so clear, I tell him probably duct tape is the best. "But we already have duct tape at home." Although I can tell it's not quite what he was looking for, I try to speed things along: "That's Ok, this can be your tape." "Is that it? Is that everything you need?" "Well... let me think... Paint. I need some paint." Hmmm. "Do you need spray paint or brush paint?" "Ok, they have Colonial Red and Apple Red. You can see the colors on the labels at the top. Which do you want?" "Apple Red. I like apples." He didn't even glance at them. Who needs colored labels when the paints have such precise names? "Ok, Apple Red. Now for blue, I only see Deep Blue." "Umm, no, I need black." Uh oh, a third color. I am nixing this if it goes to three, you have to stick to your guns on these issues. Give 'em an inch... "Black?" I pause while I try to decide if he can read my mind. "Ok, here's black. Do you need a brush?" I might as well get credit for getting him the full Monty, I know the brushes I have at home are rather stiff. "Yes. I'll go ask the lady where they are. Wait here Daddy, don't move. I'll go ask." "Wood, Dad, I need wood." Ahhh, the dynamic shopping list. We are not even in the lumber aisle this time, his buying impulses are no longer limited by what's in sight. "What for?" Oh yeah. That. This kid never forgets anything. "What are you going to do with the table?" "I'm going to paint it." I should have seen that coming. Then something else clicks: "Is that what the tape is for, your table?" "Is this the right size?" I can tell the plywood isn't going to match his room's current decor. "Where are you going to put this table?" Now we're talking. A table for the tree house? That's cool. I can spend a few bucks on that. Why didn't he just say so before? "Ok, well, we better get some treated lumber instead." "You want plain ones or ones with turnings?" I'm into this now. "How many legs?" I ask just to be sure. Thankfully it sounds like a normal table. "What size again?" He shows me a 2-foot by 2-foot shovel stand the right size. "But without the holes on top" he adds. We get an 8-foot board to quarter for the top. We talk about using screws to hold the table together. "Is there anything else you need?" I ask, holding my breath. "No, we have screws at home." I don't ask twice this time. 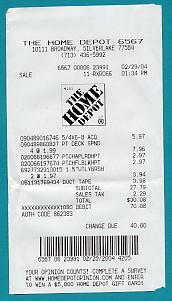 We get out of Home Depot for $30.08, plus some cash back. Not too bad. "Here is the board. And the saw. This is the table I want you to make." "Ok Guy, how do you want to do this? Do you want a red top and black legs, or the colors all around?" "No Dad, I want squares. We need to tape squares." "Squares? What kind of squares?" "I want a checkerboard on it. 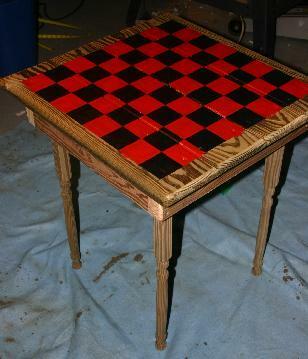 I want to play checkers on it." I am momentarily paralyzed. THAT'S what all this has been about! That is such a cool table! Why didn't I think of that? What could be more quaint, more classic, more Norman Rockwell than a checkerboard table in a tree house? I still can't move as a flood of recognition hits me: THAT'S what this has been about the whole time! He had all of this planned from the beginning. The tape, the table, its purpose, its placement, the paint, the colors, everything. Delight, pride, gratitude, disbelief, shock, and more and more pride, all swelling and swirling together. I can't think, I can't focus. 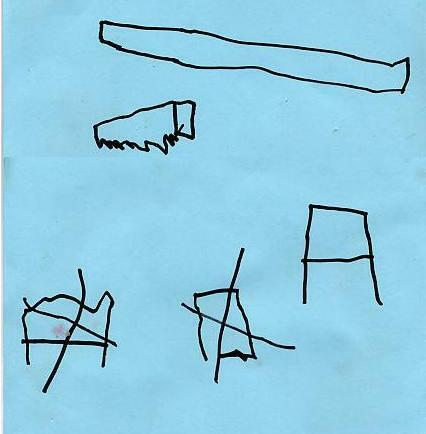 My four-year-old wasn't showing me pictures, he was showing me blueprints. He certainly was not impulse shopping, he knew exactly what he needed, every step of the way. 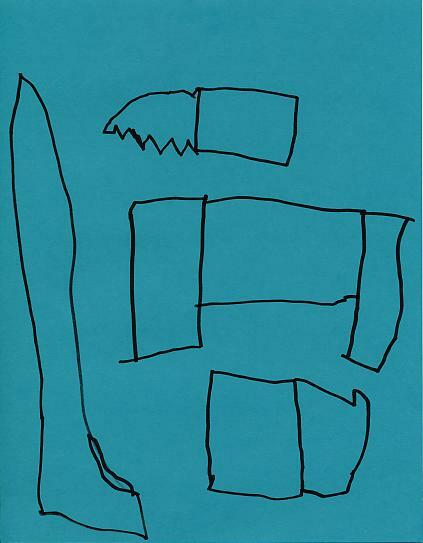 He had been looking for the blue masking tape we had used when painting his room. I had thought he wanted the tape to hold the pieces of the table together, but he knew to use screws for that. He wanted to tape the wood to mask the squares for painting. There is not an adult who could have planned it better or more thoroughly. Now I'm fighting back tears of pride, and my heart is about to burst. I think back over the day and see the signs now. I remember earlier bits and pieces that all make sense. I should not be surprised, this is not the first time something like this has happened. I certainly didn't think it was beyond a four-year-old's ability, but I just never saw it coming. I keep trying not to underestimate the little stinkers, but they keep sneaking up on me. I strain to recall every conversation and scramble to recover all the pieces of paper. I want to remember this day forever. I stay up typing and scanning everything in until 7:00 a.m. because I don't want to lose a moment. I am so grateful that I let myself follow what I thought were his whims, and I dread how easily a 'wood tape' project might have been dismissed. I am proud of the way my wife and I have raised our sons, and so very proud of the boys. I am more content a father than any man deserves to be. Drawings copyright (c) 2004 Guy Nesin, used with permission.